Today is the deadline for the Education Select Committee's call for responses to the draft SEN bill. I've seen a number of responses so far. 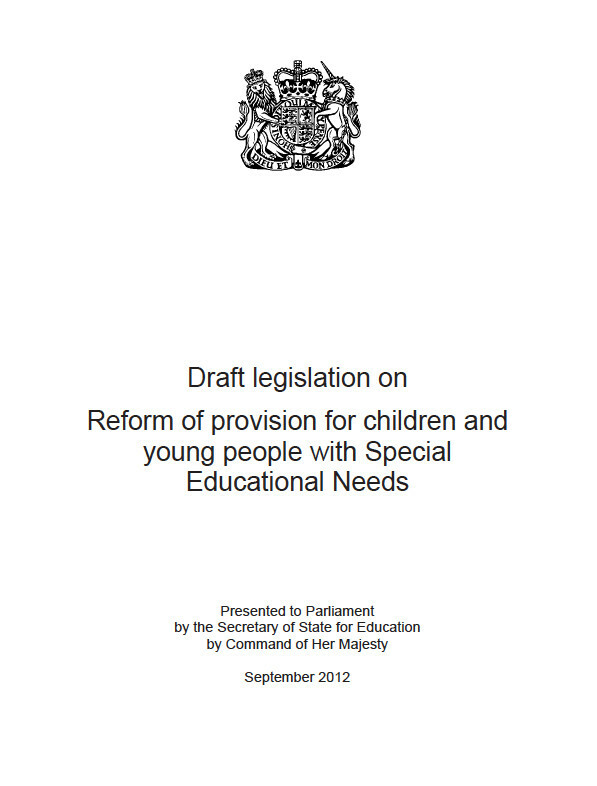 Some are concerned about the legal issues raised by the bill, believing that it reduces the statutory protection for special educational needs and children. I have no legal expertise whatsoever and so am not in a position to offer any analysis of this, but from the position of having background knowledge from working within the pathfinder, some of those potential issues highlighted do not seem completely accurate. However, having said that, these opinions are a vital addition to the responses so that the select committee has as wide a range of opinion as possible to consider. As a parent-carer forum, Family Voice Surrey, for which I am co-chair, has approached our response from our experience as parents of children with SEN and disabilities and from our knowledge of the Surrey/SE7 pathfinder . Our response is broadly similar to other parent-carer forums who have had the same experiences. It would be wrong for us to include any legal issues as that is not our area of expertise and simply parroting the views of others is unnecessary when they can speak for themselves. Parts of the bill are clumsily worded, so that if you have been working on the pathfinder, you might understand what the intention is, but it has not been stated clearly or in sufficient detail and this is a huge shame. Quite possibly this is an indication of it being put out too soon with insufficient consideration of the fact that SEN is a hugely complex and broad area. This failure has led some to believe that the government is trying to strip away SEN support by the back door. Again, there may be a Mr Burns figure rubbing his hands with glee in the dark corridors of the Treasury at the prospect of saving money on the backs of disabled children, but this is quite a cynical view. Which is not to say it isn't true. My co-chair, Angela Kelly, and I recently took part in an interview with SQW who are evaluating the SE7 (South East group of pathfinder authorities) for feedback and we reiterated our view that the reforms will not be what they might if the pace continues as it is. Corners will inevitably be cut with the trials in some areas to meet artificial deadlines and so a thorough testing of the proposals will not have been carried out. And let's remember who these reforms are supposedly intended for - the stated aim is that they end the adversarial system and benefit children with special needs and their families. It is not, claim the DfE, a cost-cutting exercise in itself. But SEN is not just about statements, it is about providing the right solutions for children with complex needs, early intervention, transition, personal budgets and more. With the new EHCP, this will also bring in NHS health and psychological support from CAMHS. It is a massive undertaking and even though people are working very hard to try to make this happen, rushing it for political reasons (for what other reason can there be?) is detrimental to getting reform right. Even the select committee deadline of today is patently ridiculous - some of the questions being asked as simply unanswerable because there simply has not been sufficient time for any trials evidence to be generated, let alone collated. Some of the issues with the bill include the problem that only education is at present enforceable, so health and social care have no statutory duty of their own to fulfill the requirements set out in an EHCP. Which means it won't happen. Also, the issue of compulsory mediation before an appeal can be launched is hugely problematic - it will delay the process unacceptably. And if a young person has finished education but still has health and social care needs, would they still have a plan up to the age of 25 in the same way as they probably would if they had educational but not health or social care requirements? It is, of course, a draft bill and one can only hope that all the submissions made to the select committee are carefully considered and taken on board and the required amendments made. When the results of the pathfinder begin to filter through, further detail can be added to the draft bill. I would hope that whoever is in charge of setting the bill's deadline would have the courage to say, "Okay, we do need more time. We were aiming for early 2014, but let's take another six months". Does that type of courage exist in the DfE? You tell me. Here is a list of the responses I have come across so far, with links. If you have one you'd like to share, please leave a link in the comments. Thanks for posting your thoughts. I am one of those people with cynical views, that have, unfortunately, been forged through dealings with my local authority. Whilst the extension to age 25 is to be welcomed – though the details/exemptions/limits have yet to be made clear, the nagging question is why change what already exists? There may be a case for amending the existing EA 1996, but as the changes to statements to EHC plans are going to be relatively minor (no duty to provide health or social care, and indeed possibly the removal of SALT as an educational need) what is the point? The existing law (and case law) is quite clear on what should happen to children with or without a statement. It is good law. There is already a duty on the LA, health and social service to work together. In the main, problems arise from local authorities and schools who simply do not follow the CoP and law. There is no provision in the draft bill to stop LAs continuing to behave unlawfully. The government can change the rules as much as it likes, but by continuing to ignore the issue of compliance the same structural problems will remain. The Government refuses to engage with this issue – there is no response at all in the recent SEN consultation documents. The problem has been historically exacerbated by encouraging local authorities to delegate funds, pushing responsibility onto school Governors to make their ‘best endeavours’. If you cast your mind back before the election, the Tories were saying they would split assessment from funding. That was dropped as soon as they came in to government. Why? The cynic in me says the most likely reason for the changes is to reduce/remove provision and reduce costs, as you have mentioned and alluded to in some of the linked responses. The splitting assessment from funding is a great point and something I have talked about in the past. I agree completely that this needs to happen. I also agree that there is nothing, fundamentally, wrong with statements, as long as those involved do what they are supposed to do, for the good of the child. This is what has not happened and why we are here now. I’m not sure I agree with your point about them wanting to reduce or remove provision (entirely). I think there is a will to do the right thing, but that this is in a tug of war with the need to save money. The question is – who will win? We have to keep the communication channels open, be vigilant, keep saying what we’re saying and be resolute. As SEN parents, it’s tough doing this and balancing our (often extreme) demands in life. Hats off to everyone who continues to do this, you are all extraordinary people.